Reptiles ~ A Parents Guide We are often asked if reptiles make suitable pets for children. It would be easy to simply say yes, they are a great pet for children. However with ANY form of pet for a child or young person there must be special considerations. This guide aims to offer the pros and cons of reptile ownership. Ownership of reptiles or ANY other form of pet includes a level of responsibility and a duty of care towards ensuring the animals welfare needs are met. The age and maturity of the child will be a determining factor in how much he / she can bear this responsibility. Some very young keepers have demonstrated exceptional levels of responsibility with their pet being looked after to the highest standards of care. Sadly some older keepers (including adults) , have failed to meet the care requirements for their pet. Every child or young person is different and only you know how much responsibility you can entrust your son / daughter with. However one thing is absolutely certain, within the eyes of the law, the young persons parent or guardian bears the ultimate responsibility for ensuring the animal is properly cared for. This includes ensuring the animal is housed appropriately, fed an adequate diet, kept at an appropriate temperature, receives any specialist lighting, is kept in hygienic conditions etc etc. If the animal needs veterinary treatment, the adult is of course responsible for ensuring it receives it. In reality, the ownership of reptiles by youngsters is best considered a shared responsibility between parent and child. Obviously as a young person grows, their life commitments change. Many species of reptile, if given appropriate care, are long lived. A Leopard Gecko or Royal Python can live in excess of 20 years. Some species of tortoise can live much greater lifespans. Thinking ahead to the future,who will look after the animal if the young person goes to University,works away from home ? Is a reptile a suitable pet for a child or young person ? As already stated, this is far from an easy question to answer. If the family environment, the shared commitment is established and the appropriate species of reptile is chosen the answer is in most cases yes. However without the commitment, without prior research it can be against the child and the animals interest to allow them to own a reptiles. It can result in injury to the child or suffering for the reptile. However the same can be said for virtually ANY species of pet !!! One of the key elements towards a young person successfully owning a reptile is research. Research the care needs for the reptile of interest. We would advise that the young person is encouraged to access a variety of sources to gain as much information as possible to hep them select an appropriate reptile. We would also strongly advise that you as the responsible adult study the information too. If possible speak to keepers or breeders of the species of interest and discuss the suitability of the animal for a young keeper. It is fine agreeing to your son or daughter owning for example, a snake or a gecko. However there is a vast difference between owning a relatively docile and moderately sized Royal Python and a feisty Reticulated Python that can grow to a very powerful 16ft plus. A Crested Gecko can be a gentle pet that tolerates handling whilst a Tokay Gecko is renowned for its fierce temperament and its ability to inflict a nasty bite. A Bearded Dragon, one of the most commonly kept species can make a wonderful friendly pet. It does however when it reaches adult size need a large enclosure of 4ft x 2ft x 2ft. This is not an excessive size for many households. An Australian or Chinese Water Dragon however would need an enclosure double that size. It is therefore essential that you carry out research to ensure your son / daughter owns a suitable reptile. Sadly experience has shown that not all reptile shops can be relied on to give you accurate information regarding the the various animals they offer for sale. On the other hand some shops provide excellent information and advice. The problem is, as new keepers you will probably struggle to differentiate between shops that offer good and poor advice. This is why we advise you to carry out independent research and speak to other keepers and breeders. We have had the pleasure of raising three sons whilst owning a large collection of reptiles. We can speak from experience of the valuable contribution reptile ownership has made to their lives so far. 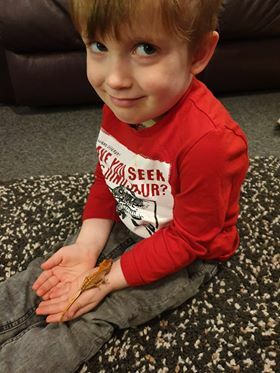 From primary school, through to secondary school and college we have received feedback that has clearly shown that their interest in reptiles has had a positive impact on their educational activities. Our sons found that their interests in reptiles, helped them in numerous subjects, biology, geography, art being just three examples. They have become aware of the adaptive nature of reptiles, their place in the eco system, the dangers they face through pollution, habitat destruction and plundering for the exotic medicine, food and skin trade. They have learnt about genetics, life cycles, disease and numerous other topics that their hobby links to. We have numerous reports from their schools where the positive impact of their reptile keeping hobby has been mentioned as aiding their progress. 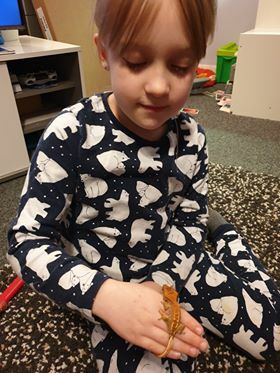 Caring for their pet reptiles,has helped our sons develop a greater level of responsibility, commitment, patience, confidence and has encouraged them to develop skills of independent research. As a parent I can say with confidence that all three of my sons have gained something positive through owning and caring for reptiles. The Risks and Dangers of Reptile Ownership. It is natural for any parent to be nervous of introducing their child to a species of animal they they are not familiar with themselves. If you have read some of the material published by organisations opposed to keeping reptiles as pets you could easily be fooled into thinking reptile keeping is a very hazardous hobby. The reality is, providing common sense is applied reptile keeping is a very safe hobby. It would be wrong to say that there is absolutely no risk from owning reptiles but when the risks are analysed they are actually minimal. It would of course be wrong to say that owning any animal is ‘risk free’. There is risk with virtually every species kept as a pet. Often this risk is miniscule but on the other hand , some species can be positively dangerous. Sadly we have heard of tragedies such as children being killed by giant constrictors. However we would hope that your youngster would not be owning a 20 foot snake. Such a beast is a vastly different animal to the more commonly kept Corn Snake or Royal Python. Some reptiles have powerful jaws and sharp teeth but we do not envisage you owning something like a Dwarf Caiman or one of the crocodileans. Lets put the key risks into context. Salmonella. It is a fact that some reptiles carry the salmonella bacteria in their gut, it is thought to be part of their normal gut flora. There is a risk of this being transmitted to humans as what is termed a ‘zoonotic’ disease via the faecal oral route. However with common sense that risk can be virtually eliminated. Whilst handling or cleaning the reptiles enclosure or food dishes there should be no eating or drinking, hands should be kept away from the mouth. After handling the reptile hands should be washed with soap and water. Such a simple strategy virtually negates any risk of contracting salmonella from your pet reptile. Salmonella is a notifiable disease, however incidence of reptile related salmonella are so few that the Department of Public Health is unable to provide any incidence statistics related to reptile infections. Incidences from contaminated food or work surfaces, under cooked chicken etc are recorded in the thousands. To further put the risk into perspective, there is greater health risk from domestic cats in the form of toxoplasmosis. Most animals carry some degree of infectious risk that easily negated with basic hand hygiene. We would however strongly advise that the very young, the very old or anyone that is immuno compromised avoids contact with reptiles. Bites & Lacerations. Undoubtedly some reptiles can inflict a serious bite or lacerations but the species that can inflict severe injury are NOT recommended as pets for children. The more commonly kept reptiles, Leopard Geckos, Corn Snakes, Royal Pythons, Bearded Dragons, Crested Geckos are not renowned for being ‘biters’ nor do the have powerful claws. If they do bite, this rare event is unlikely to inflict any serious injury. Compared to the bite of a dog, cat, hamster or rabbit a bite from the commonly kept species is usually quite insignificant. In 2012 Becky Clarke wrote as part of her Bsc in Applied Animal Sciences, ‘A report looking at the ‘Reptile Keeping Hobby’. This extremely well researched report gives a very clear picture of the minimal risk to health from owning reptiles and provides accurate comparison to the risk with more commonly kept pets. An extract from the report is posted below followed by a link to the report in full. In 2002 there were 64603 incidents from Dogs, 15006 from Cats, 2932 from Rabbits and Hamsters and 328 from Reptiles requiring hospital intervention. Figures from the NHS Trust Health and Social care Information Centre (2012) show that 6,450 people were admitted to hospital for injuries caused by dog bites during the 12 months to April 2012 which had risen by 5% from the previous year. Children under 10 accounted for more than 1,000 admissions, 75% of which needed surgery, with 494 requiring plastic surgery and 278 requiring oral and facial surgery. It is also estimated that 350,000 people a year in the UK become infected with toxoplasmosis which is spread by direct contact with dog or cat faeces or eating contaminated food. In terms of salmonellosis, there were more than 17,250 cases reported in humans in 1999, but only 7 of these were confirmed as being contracted from a reptile source (EUARK, 2012). An independent study titled CLASSP looked at the risk of salmonella infection with exposure to reptiles took place in England between 2004 and 2007. At the end of the study, there were 2,276 cases of salmonella in people who didn’t own reptiles as pets, compared to 34 cases amongst people who did have reptiles as pets (Aiken et al 2010). There is sufficient evidence to counter all the health scares that the animal welfare organisations are claiming, regarding the transmission of salmonella from reptiles to humans. Providing good hygiene is practised (i.e: washing hands after handling, wearing gloves to clean the housing and, keeping young children away from them until their immune systems are well developed), there is no real risk of the disease being spread to humans. As the studies have shown, salmonella is more likely to be contracted from other animals (dogs, cats, birds) or, by eating poorly prepared food. In summary, reptiles make good pets for younger keepers providing of course an appropriate level of supervision is applied and that an adult takes overall responsibility. If commonsense strategies are applied the risks assosciated with reptile ownership are minimal. If you do have any concerns however, you would be very welcome to contact Grinning Gecko and we will gladly go through things with you. You can contact us via our Facebook Page, email info@grinninggeckouk.com If you go ahead and become a reptile owning family, we will also be glad to help should you have any problems or concerns in the future.